winemakers, Veuve a particular favourite of mine. 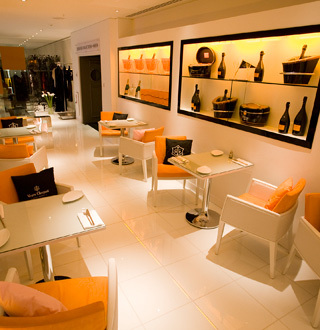 The dining room is kitted out in the signature yellow and grey colours of the brand, making for a cosmopolitan space. A stunning seasonal menu offers refined flavours, which perfectly complement the sophisticated selection of Champagne. The Champagne Bar menu include's a delicate pan seared crab cake, or hand carved Iberico ham on toasted ciabatta. Relax and enjoy the full range of Veuve Clicquot Cuvees, from Yellow Label to La Grande Dame, in stylish surroundings on Harrods’ first floor. The Veuve Clicquot Champagne Bar lets you enjoy the house's full selection of Champagnes from Yellow Label and Veuve Clicquot Rosé to the spectacular La Grande Dame. Set amongst the international fashion collections on our First Floor, this venue encompasses a contemporary bar overlooking the store and an intimate lounge and dining area. 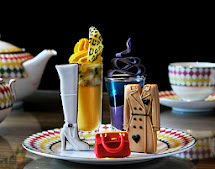 You can also purchase a selection of Veuve Clicquot accessories and gifts, available exclusively from Harrods. Hello! I am very glad to discover this interesting post. I am a french master student and I would like to invite you to help me with my master thesis by answering to my survey (it will take you about 10 minutes!). 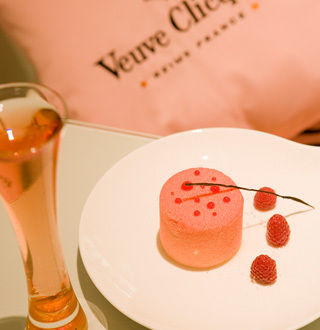 It is about champagne experiences and a part of the questionnaire is focusing on Veuve Clicquot Champagne bar. I hope you will agree to help me!